In the United States, 2 billion gallons of fossil-fuel-industry wastewater gets pumped underground through thousands of underground tubes. The purpose of injecting wastewater is to store it out of sight and to keep it from entering drinking water. But not being able to see the brine- and chemical-filled liquid doesn’t mean it’s harmless. The recent study, published in the journal Science, shows that injecting wastewater can trigger earthquakes far from injection wells. The problem is so serious that 1 in 50 people in the U.S. are at-risk of experiencing a fracking-related earthquake, according to a recent U.S. Geological Survey (USGS) analysis. Wastewater injection wells are concentrated in Oklahoma, Texas, California, and Kansas, according to the U.S. Environmental Protection Agency (EPA). 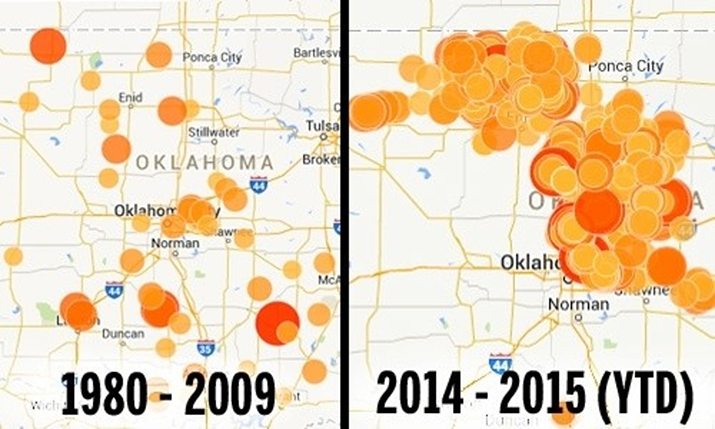 Earthquakes caused by injection wells have rattled Texas, but Oklahoma has been particularly hit hard by the temblors. Earthquakes used to be a rarity Oklahoma, but the state has experienced a 2,800% increase in quakes from 2009 to 2014. Experts have warned that the “big one” could slam Oklahoma at any time. In 2011, scientists linked an injection well in the state to a 5.6-magnitude earthquake that damaged a highway, rattled buildings, and generated dozens of aftershocks. Writing for The Conversation, Brodsky explained that she collaborated with her colleague, Thomas Goebel, to find out how injection wells cause earthquakes so far away. The duo examined injection wells around the world to determine how the number of earthquakes changed with the distance from injection. They found that some wells triggered quakes up to 6 miles away. And while conventional wisdom states that injecting wastewater into sedimentary rock rather than harder underlying rock reduces the risk of triggering larger and more distant earthquakes, Brodsky and her colleague found the opposite to be true. She explained that injecting wastewater underground can create a pressure that changes the shape of the surrounding rock and pushes faults toward slipping in earthquakes. This is called “poroelasticity.” Water doesn’t have to be injected directly into the fault to trigger earthquakes via poroelasticity, so the process can trigger them far from the injection well. One type of earthquake formed close to the injection well, but stopped abruptly approximately a half-mile from the site. Earthquakes were more likely to form close to the site if the wastewater was injected into rigid bedrock (basement rock). There, pressure from water that spilled into a fault triggered the earthquake. 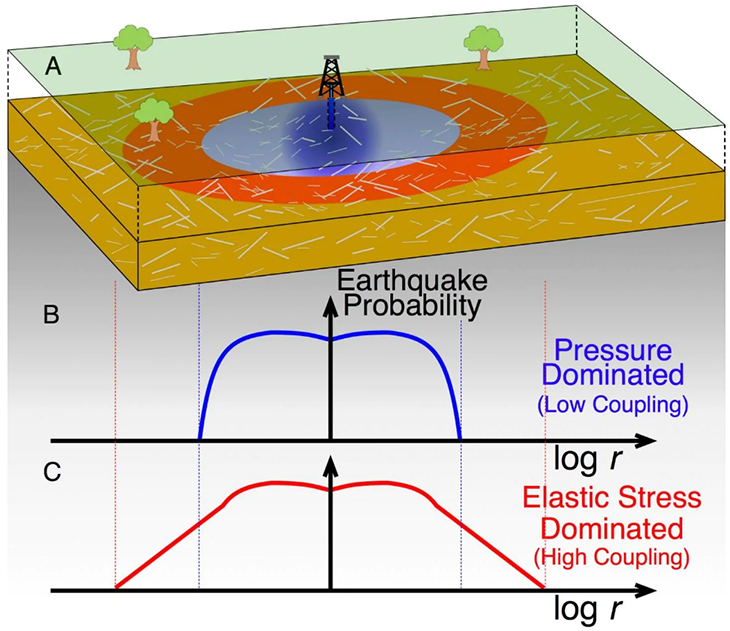 The other type of earthquake could form far from the well, often several miles away. This occurred when wastewater was pumped into softer sedimentary rock. Brodsky gave the example of stepping on a latex balloon sitting in a cardboard box. The balloon bulges outward and presses against the walls of the box in the process. 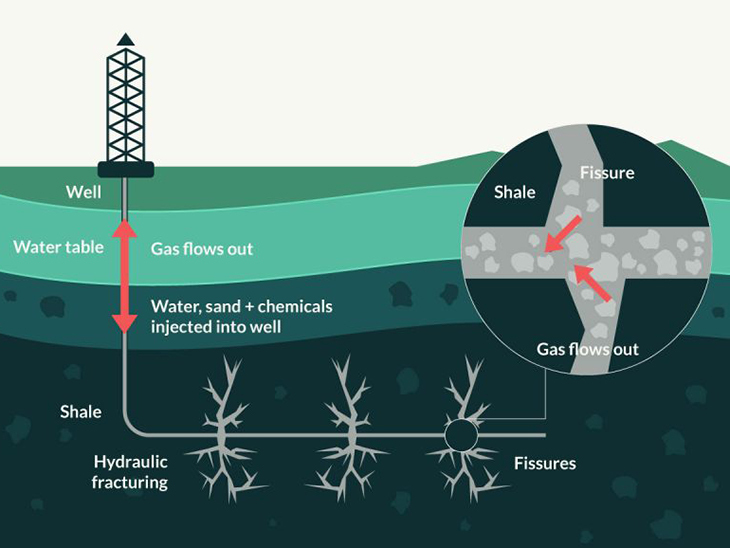 Likewise, as sedimentary rock balloons out from the injection of wastewater, it can push faults far from the injection well, resulting in seismic activity at a distance. But since the pressure that a well exerts decreases over distance, it’s not clear how far earthquakes may occur from injection wells, she explained.